What with the recent release of Opera 9.6 one would think that the developers at Opera would be looking to relax a bit. 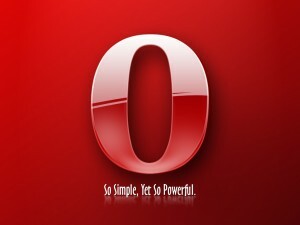 Instead, however, they are forging right ahead and making plans to release Opera 10 (at least the alpha version) before the end of the year! Could this be because the browser competition has heated up? We have already seen the first casualty, the Netscape Navigator. Perhaps the advent of Google Chrome has opened everyones’ eyes up. Users now realise thanks to Google’s strong image that there are alternatives available to IE (Internet Explorer). This benefits every internet browser other than IE of course. Developers have also realised that they have to work harder than ever to stay ahead or at least keep up with the competition. As it is, the more common internet browsers are: Apple Safari, Google Chrome (no real exposure yet, but it will get there with Google’s backing), Microsoft Internet Explorer, Mozilla Firefox, Opera. However there is a host of less known ones too such as: Maxthon, Avant, Flock, K-Meleon, etc. So there is a lot of competition and for users like me a lot of choice too. I was an Opera devotee for years, and still prefer its look, but FireFox’s extensions are so qualitatively and quantitatively better than Opera’s widgets [bulk downloaders, stumble on, ad blockers!] that i had to jump ship. Opera wants to improve its interface? They should fix Widgets first. The first browser that manages to offer many easy to use and STABLE add-ons/widgets/extensions is the one that’ll take the market. Right now, FireFox looks closest, tho Mozilla seems to be slowing down innovation-wise. Rightly said, Firefox is leading the race with its highly active developer community. That’s where most of the other browsers are suffering. Indeed its my opinion as well that it is not so much the looks/interface that is the problem but the lack of extensions/plug-ins/widgets as you so rightly point out.